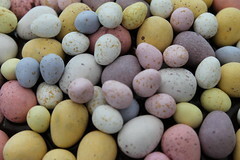 There is a sweet lady who lives at the retirement facility where we do services who shared with us last week "If there was no Easter, there would be no Christmas." This statement is indeed true. As miraculous and wonderful as the virgin birth of the Lord Jesus Christ was, if it had not been followed by His life of sinless perfection, His death on the cross in accordance with prophecy and the resultant Resurrection on that first Easter Sunday, we would not have anything to celebrate as "Christmas." Today I began thinking about Mrs. Marie's statement and realized if there was no Easter, we also would not have Thanksgiving. Many of those Pilgrims of Plymouth Plantation were Christians who had fled to the New World seeking religious freedom. If there had been no Easter, they would not have been Christians in need of a new place to worship in freedom. If there had been no Easter it is likely there might not have been an Independence Day, a Veteran's Day nor a Memorial Day. Our country may not have been founded in the same way, on the same principles, with the same Constitution. We certainly wouldn't have President's Day. If there had been no Easter and our country had not been founded by the same men and built on the same Constitution with the same value for the citizens and their hard work and effort, there might not be a Labor Day. We might not value mothers or fathers and celebrate their days either. Since even our years are marked by the Resurrection of the Lord Jesus, using BC and AD, perhaps even our calendars and timing mechanisms would be different if there had been no Easter, and we would not have a New Year's Day. Considering how monumental to the whole human race that one day, that one moment was in the history of mankind, isn't it amazing how quiet, how solitary it was? No camera crews, no crowds, even the guard assigned to the tomb "trembled and became as dead men." As we look toward tomorrow, which our society has enshrouded with bunnies and eggs and chocolate (although I like the chocolate), let us remember that this day was perhaps the most important day in the history of the entire human race. 'Do not be afraid, for I know that you seek Jesus who was crucified. Then go quickly and tell His disciples that He has risen from the dead' "
We have two wedding pictures which don't actually show what it looks like they show. The first is the obligatory cake eating picture. This is not one taken by the photographer, but was snapped by a relative at the same time from a different angle. At the time of our wedding, I had a bad burn on my right index finger, so when I fed Glen his piece of cake, I didn't use that finger to hold the cake. Instead I held my sore finger out straight to avoid bending it. The resulting picture from the family member's angle looks as if I am trying to feed Glen the cake and scratch his nose simultaneously. I am absolutely certain this wasn't the case, but you wouldn't be sure of it just looking at the picture. actually is catching the garter, but another, shorter gentleman is beside him, also reaching for it. The picture gives the impression he is holding the groomsman's arm up to help him catch the garter. Knowing both men, I also know this was not the case, they would have been in fierce competition for the little piece of lace and ribbon. These pictures, taken 34 years ago, long before the days of digital photography, show that even then you couldn't trust what you see. In these days, it is especially true, you should never trust a photograph! The Bible calls us to be just as careful about other appearances as well. As Christians, we are called to have discernment, to utilize that quickening power of the Holy Spirit to discern between the spirit and the flesh, between truth and error. Not everything that appears to be of the Spirit is of the Spirit. Not every thing that calls itself of God is of God. Not everything that is named Holy is of the Holy Spirit. In the book of James the Bible says that if "any of you lack wisdom, let him ask of God, that giveth to all men liberally, and upbraideth not; and it shall be given Him," (James 1:5.) Lacking wisdom is no excuse since the Lord is more than willing to give to all, all we must do is ask. We must be sure that we balance all our judgments not only by how we feel about things, our experience of them, but also by what the Word of God has said. The Lord will never lead us to do something apart from or against what He has already directed in His Word. Our judgments must be righteous, or in accordance with God's character, nature and Word. Yesterday my husband and I met our son for coffee and he had with him our granddaughter, Emma. While Emma was eating her ice cream, I was asking her questions about her day at school. At one point her father teasingly told her, "You're a nut, that's what you are!" I picked right up on that subject and asked her, "Emma, what kind of nut are you, are you a peanut?" "Are you a cashew-nut?" We have made enough trips to the Peanut Shoppe in our town which sells all varieties of roasted nuts, I knew she was well aware of what cashews were. "Are you a pecan?" I thought perhaps she considered herself more of a Southern girl! "Well," I was running out of nuts I thought she might know, "Are you a hazelnut?" "Well, what type of nut are you then?" I was very curious as to what her answer would be. She sat for a minute with a thoughtful look on her face and then said very definitively, "A doughnut!" What a perfect answer! I would want to be a doughnut too! Her father had told her she was a nut and she picked out the nut she wanted to be, she just picked out something none of us expected. The Lord has a calling for each of His children. Not everyone is intended to be a preacher, in fact, very few will be preachers. Not everyone is called to be a teacher, or a singer. Maybe your calling is to perform a simple act of kindness for someone on a routine basis. I know a gentleman in the retirement community where we do services who cuts out particular newspaper articles for one of the other residents there who doesn't get a newspaper, then brings them to her each week. This is an example of something the Lord may call us to do. In the Nursing facility where we also do services there used to be a resident named Liz. Mrs. Liz used to ride through the halls on her electric wheelchair and when she would pass another resident she would make a point to stop to talk to them and to try to encourage them and cheer them up. Often she would sing "Jesus Loves Me" with them because she felt that it always seemed to make everyone feel better. She had a definite calling of encouragement to the other residents where she lived. It may be your calling is just to have a sweet countenance and a cheerful attitude toward others you see. At first you may say, "That is too little a thing to be a calling!" but think of it this way. If a recipe called for pecans and we left those out, you would surely miss those nuts, wouldn't you? They are little things, but with a big impact. Why some recipes call for only a pinch of salt, but without that pinch -- such a tiny little thing -- the recipe is ruined. We had the pleasure this past weekend of attending the 50th Wedding Anniversary celebration for my sister and her husband. All of her five children were in attendance and almost all of her seventeen grandchildren. I enjoyed seeing family members I hadn't seen for many years and to have so many gathered into one place for such a happy occasion. I know that as my sister and brother-in-law looked out over the crowd of well wishers and saw their children and grandchildren, siblings and cousins, it must have made their hearts swell with pride and love. My husband commented Sunday in our chapel service it reminded him how it must be for the Lord when He welcomes His dear children home. That reminded me of this song which was very popular in the years when my husband and I first began dating. A very talented young woman in our church used to sing it quite a lot and it always seemed to touch my heart. I hope this version sung by these two little girls touches yours today. What "Tense" is Your God? "Yet ye have not known Him; but I know Him: and if I should say, I know Him not, I shall be a liar like unto you: but I know Him, and keep His saying. "Then said the Jews unto Him, Thou art not yet fifty years old, and hast thou seen Abraham?" "Jesus said unto them, Verily, verily, I say unto you, Before Abraham was, I AM," (John 8:53-58). When you think of, or speak of God --what "tense" is your God. To the Pharisees, Abraham and the prophets were dead, they were in the past tense. They thought the Messiah had not yet come (they could not see He was standing right in front of Him) and they looked for Him in the future. Our perception of the "tense" of God will determine how much we actually experience God's working in our lives in this very moment. . .in the now. If our God is a God of the past, or a God of the future, as with the Pharisees, we are not likely to perceive the miracles He is performing right before our very eyes in the today, in this minute. The Lord Jesus told the Pharisees "before Abraham was, I AM." This was name that the Lord gave of Himself to Moses when he stood at the burning bush and wanted a name to give to the children of Israel. But it is more than that. It isn't just a statement of the Who, but of the What and the When. He is the God of the Now and the All. The Lord Jesus isn't just what we needed in the past, although His death on Calvary was what purchased our salvation. He is not just what we need in the future, although He will be what sustains us throughout all eternity. He is what we need in for every minute. And He is the all in all. What is the need of your life in this moment? Whatever the need, the Lord Jesus is the answer, the fulfillment, the satisfaction. Before anything else can scratch that itch, He must first do so. He alone can fill that longing in our heart for anything because He alone what satisfies the human heart. He is the I AM for every question of our lives. As I was out walking today, I couldn't help but notice the signs of Spring literally busting out all over. I realize in this city of the Deep South we don't really have Winter, we have more of a cessation of Summer, but still, the transformation from the few grey bare bine-stems we do have, to the bright verdant new leaves of Spring is a wonderful transition. 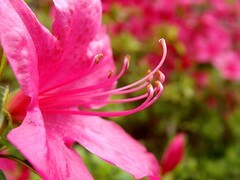 This is also the time of year that azaleas bloom in great abundance throughout our city and everywhere you look pink and purple blossoms greet your vision. For us, Spring won't be "Spring" long. Soon the days will be far too hot and far too humid to be considered Spring. . .our Summer will begin long before the word appears on the calendar. But for today, even though much of the rest of the country is facing bitter temperatures and even blankets of snow, we have Spring. In our lives, we often go through seasons of winter, times when things seem bare and grey and dark. We may feel cold and alone. But rest assured, Spring is coming. The new leaves will push out, the flowers will bloom and the new life will appear. It is the way our Lord has designed it to be. It has always been this way, and it will be this way again. If your heart is weary, let the changing of the seasons give you hope. The times of winter only last for a season. Sometimes we wonder, will there ever be a spring? Sometimes we wonder, Is there hope for me? Is there hope, is there hope for me? the time of the singing of birds is here. and our Beloved is at hand. We must trust His heart, when we cannot see His hand. When He seems so far apart, and we cannot understand. life will once again appear, amid the dark and dearth. Rise up my love and come away, My glory you shall see. I lift my head in wonder, and I look upon His face. Oh beloved, take My hand. This past weekend, we took our grandson Jackson to his T-ball game. Our granddaughter Emma soon tired of watching little boys try to hit the ball off the tee. She wanted to go to the colorful playground in the center of the ballpark. I walked over there with her, sat on the "Mommy" bench and watched as she ran from one piece of equipment to another. My eyes were never off of her, not so much because I was afraid someone would steal her away, but because Emma is fearless. She climbs, she jumps and sometimes mistakenly thinks she can fly. Her broken collarbone (the result of attempted flight) is far enough in the past now, she just might try again. I noticed frequently throughout her play time she would turn and look back at me. I could tell she was pleased to see each time that I was intently watching her. A grin would spread over that impish face, then she would flit on to the next activity before her. At one point she did indeed climb higher than I would have liked. Some of the older boys had found a way to climb on top of a piece of equipment that looked like a whale and were perched on the "whale's back." She managed to get herself up there (not thinking much about the dress she had on, obviously). She immediately looked backward at me to see my reaction. I didn't get on to her in anyway and I didn't tell her to come down. . .I wanted to see how she would accomplish the feat of extracting herself from where she was perched and I wanted to see how long it would take her to attempt it. She had a little difficulty at one point, but I just sat still. I let her figure it out and figure it out she did. She managed to get both her feet back on the safety of the platform and appeared to be quite proud of herself for her accomplishment. Again, her face turned back to me to see if I had watched her. Then she slid down the slide in front of me and ran to tell me about sitting "on top of the whale." "I saw that," I told her, "but you looked a little frightened at one point." "Yeah," she sort of brushed it off, "sometimes I get scared up high." She must not get very scared up high, because this girl climbs and jumps and dances and I swear if she could flap her arms fast enough she would fly. But in all that activity, it was important for her to frequently look back and see if someone was watching her. She was so glad they were, and I was so glad I was there to do so. It should be a comfort to us to know that as Christians there is One that always watches over us as well. His eye is always on us with a heart full of love and care and tenderness. We will never look at Him that we do not catch His eye first looking at us. "Are not two sparrows sold for a farthing? and one of them shall not fall on the ground without your Father. But the very hairs of your head are all numbered. Fear ye not therefore, ye are of more value than many sparrows." Our grandson Jackson, who is just finishing the first grade, loves to read. I am amazed at the words he easily reads without any hesitation or difficulty. I am quite sure I was in at least the third grade before I knew many of the words he reads today without even finishing the first grade. When Jackson was almost ten months old I started writing a journal for him. I wrote thoughts I had of him, stories of things we have done together, stories about his father, his aunts and his grandfather. He and his sister Emma love to take down "their books" and look at them. I wish I had started this sooner, and I guess I will stop it when it ends, but I wanted to take some time to let you know you are special and loved and that you have a wonderful place in my heart. Since I print more than I write in cursive, Jackson easily began to read the words aloud, not having any idea what he was reading, or who they were from. When he came to the last two, he pointed to them and said, "What's that say?" When I told him "Grannie Frannie," he got the biggest smile on his face and immediately turned around to me for a huge, and I mean HUGE, hug. It was obvious the words had touched his little heart. It was even more special that this very first time he read the words himself he did so when the author was right there beside him waiting for his response. It was a moment I will never forget and I will be sure to write it in his journal so he will be able to remember it later as well. We, too, have a "journal" written to us by One who loves us, who finds us to be special and who has made a special place for us in His heart. How wonderful when we read the words of those pages and discover, as did little Jackson, that Someone loves us enough to write it down, to record it, to put it to paper. Even more wonderful when we know that the Author is right there with us waiting for our response. Our heavenly Father can be no less blessed with our reading His words than I was blessed by Jackson reading what I had written to him. And the cost of our Father's "journal" is so much greater. I have written in Jackson's journal so that he could know me long after I am gone, so he could know things of his parents, his grandfather, his aunts that he might not remember or ever have opportunity to know otherwise. Mostly I wanted him to know just how greatly loved he is. The same is true with the Scriptures given to us as our "journal" from the Lord. Let us take every opportunity we can to explore what is written in "our book" and to learn what our Lord has said for us, to us and about us. "I will delight myself in Thy statutes: I will not forget Thy word." I had a wonderful experience yesterday afternoon. I was preparing to go into work for what would be a seventeen+ hour shift. Earlier, I had been telling my husband about my desire to try yet again to make my mother's chicken and dumplings I remembered from my youth. There is nothing really special about this recipe, except for the fact that I always loved the airy, fluffy dumplings that resulted from her dropping the dough from a spoon into the chicken broth, instead of rolling them out as my father did when he made them. The result was something that looked sort of like a cloud. It was white and fluffly and soft on the outside. On the inside it was airy and light and perfectly done, like a biscuit. I had tried before to make them, but never quite had managed to get them like Momma's. Then one day I happened to be watching a cooking show when they were making gnocchi. That's when the light went off in my head and I realized exactly what I had been doing wrong on all my previous attempts. My husband, knowing I had a particularly stressful time ahead of me, made the chicken in the pressure cooker, and even strained the broth for me. It was already simmering in the pot when he called me to the kitchen. He makes wonderful biscuits and had biscuit dough for me to use as my dumplings. Llike my daughters, he is a true foodie. He looked at the simple, relatively spiceless broth and immediately suggested multiple ways to spice it up. But that wasn't what I wanted. I didn't want "foodie" dumplings, I wanted "Momma's" dumplings. I dropped my little ball of dough into the broth and waited. In just a few moments I had several little fluffy clouds floating on the surface. I couldn't believe it when I tasted them and it was as if I had been transported back to that pine-paneled kitchen, sitting at the bar eating the dumplings she had made for me. It was truly comfort food. I ate dumplings until I thought I would pop. Our God is the "God of all comfort," which means any comfort we experience in some way has come from Him. Whether it be that soft bed, that warm blanket, that kind word from a friend, or a hot bowl of fluffy dumplings, they are all ways in which He comforts us. This comfort isn't just for us either. . .it is to share. The comfort He pours into our hearts we then turn around and pour into someone else who is hurting and in need. We receive, not to store up for ourselves, but to pour out upon others. So let us enjoy every thing in our lives that brings us comfort even more knowing it is one of the many gifts our Father has lavished upon us, and let us lovingly bestow them upon others as well. At the insistence of our son, my husband and I began watching the PBS series, "Downton Abbey." Being a fan of many historical novels, especially Jane Austen and Charlotte Bronte, he felt certain that we would like this particular series, set in a fictional Yorkshire country estate and depicting the lives of the aristocratic Crawley family and their servants in the post-Edwardian era. He was right. We have greatly enjoyed the series. At a particular point in one episode, the butler, Mr. Carson, is cautioning the staff downstairs that everything they do is a reflection upon the family and the family's honor. He continued that the desire of everyone in the house (referring of course to the staff) was to reflect honorably upon the Lord of the house. Immediately my mind flew to our relationship with our Lord. Indeed, everything we do does reflect upon the Lord of our house. As Christians, what we say, how we say it, even our general countenance, reflects upon the Lord Jesus Christ. And as Mr. Carson so succinctly expressed it, we desire to reflect honorably upon the Lord of our house. Let us remember that there is always a world watching. There is always a testimony being given, even when no words are being spoken, and we want what we are saying to be reflecting what our Lord would want us to say. The Mutual Faith Both of You and Me. . .
Every Sunday morning, my husband and I drive eighteen miles to a little Bible church in the community of St. Elmo for Sunday School. As we reach the door of the Fellowship Hall, there is one thing I am absolutely certain of before I open the door. . .I am going to be be blessed. The faces of the people in this church radiate love and joy and their hearts express it warmly. Their arms are open to us and we love joining them each week. Paul knew that in visiting the Romans he would not only be bringing them comfort and blessing, but that he, too, would be receiving the same. He knew it would be a mutual comforting, a mutual blessing. Isn't it wonderful when the Lord put those in our lives who provide for us that mutual blessing. There are those we love to see and we know that they love to see us in return. . .it is almost palpable between us. I think that is the Spirit of God in each of our hearts. "Deep calleth unto deep. . ." as the Scripture says. What a wonderful thing to know that as Christians we have been joined into this wonderful family where blessings and comfort and love are mutual things and that the bond is greater than just fondness and admiration. We are bond by the Spirit of God within us, which can never be destroyed. I don't understand how I can have tennis elbow since I haven't played tennis in probably twelve years, but our dear friend Mike, who is an excellent physical therapist, has examined me and proclaimed it to be so. The closest I have been to playing tennis is watching matches of Wimbledon or the Olympics on television for a glimpse of our friend Jamey, who is a tennis official and often officiates some of these televised matches. Clearly, my "tennis elbow" hasn't come from any proximity to a tennis racquet, but the pain generating from my elbow and waking me up in the middle of the night, agrees that the tendon is definitely inflamed. Last night when I awoke, my elbow throbbing and aching, I thought of my husband's aunt, who is going through a difficult and trying time. I thought of how my pain was limited to my elbow, but her pain was of the heart. There was nothing I could do for her at 3am to ease her pain. . . in fact I don't think there is anything I can do in the waking hours to resolve her problems. There was, however, and is, one thing I could do. I could pray for her. Isn't it a wonderful thing that the Lord has given us this gift of prayer, and that we can in turn give it to others? Any time, any place, any situation. . .we can pray. It is never out of season, it is never unwarranted. In times of blessing, the prayers of thanksgiving and praise should flow. In times of need, the prayers of supplication and intercession can be lifted up. Whether we know the persons for whom we are prayiing very well, or not at all, we can still pray. Recently my husband bought us some Swiss Army tools to put on our keyrings, the all-in-one type tool. It is a handy-dandy thing that has various screwdrivers, pliers, wirecutters, wirestrippers all in a tiny little footprint dangling on my keychain. Prayer is lke that. It is the multipurpose tool of life, with actions and purposes that spill over into the next life. May we often avail ourselves of this "tool," this great gift the Lord has given us in our lives, which can be applied in any situation. and ye in Him, according to the grace of our God and the Lord Jesus Christ." There are people in this world who choose to deny the existence of God. They have decided that this beautiful, intricate universe in which we live has developed by chance and random occurrence. They have looked at the wonder of their own hands and decided that the ability to play the piano, or type with few typos (something I have not mastered) comes just as the need to do so presented itself over eons of years. These persons want to live their lives independent of the God who created and continues to sustain all around them. If our Lord were a petty god, He would perhaps say to them, "OK, you can be independent of me. That's fine. But find your own air to breathe." You see the Scriptures tell us that "God that made the world and all things therein, seeing that He is Lord of heaven and earth, dwelleth not in temples made with hands; Neither is worshipped with men's hands, as though He needed any thing, seeing He giveth to all life, and breath, and all things;" (Acts 17:24, 25.) He gives everyone, whether they accept His existence or not, ALL things, including our very breath. I was talking with my grandchildren one day about how wonderful it was that the Lord didn't make it so that we had to remember to breathe. How would we ever sleep? He makes sure we take that next breath . . . He has built it into the design of our bodies that we cannot "forget" to do so. He gives us life, He gives us breath, and He gives us everything else. In His graciousness and kindness, even when we are rebellious to Him -- whether they be moments of rebellion or years of it -- He doesn't tell us to "get our own air," He continues to lovingly provide us with our very life. If nothing else, that shows the nature and character of our God. It presents to us the depth of His love, and His willingness to patiently wait for us to turn to Him, all the while using "His air" while we vehemently proclaim our independence of Him. How infinite must be His patience, how great must be His love. "The LORD is gracious, and full of compassion; slow to anger, and of great mercy. He will fulfil the desire of them that fear Him: He also will hear their cry, and will save them."